Andrew McAnerney is a versatile musician with a passion for choral excellence and music accessibility. Since graduating from Magdalen College, Oxford, in 1998, Andrew has worked as a conductor, soloist, consort singer, and arranger. 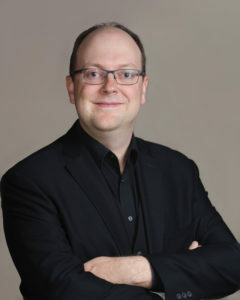 Prior to relocating to Canada in 2012, Andrew founded choirs in Oxford, Guildford and London and worked with community, academic, and professional ensembles throughout the UK. He has particularly enjoyed directing modern premiers of rediscovered renaissance works and liturgical performances of Bach’s Passions. He made his Canadian conducting début with the Cantata Singers of Ottawa on March 1st, 2015. As a professional tenor, Andrew has performed extensively with many of Europe’s finest ensembles, including the Tallis Scholars, The Brabant Ensemble and Contrapunctus. He is also a Hyperion Artist. Andrew enjoys living in downtown Ottawa with his young family. Visit Andrew McAnerney’s web site.